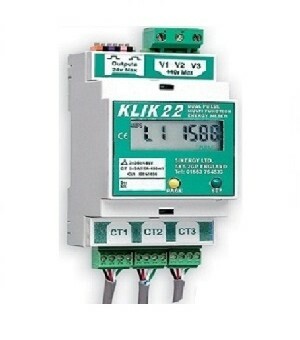 The KLIK22 sub-metering system is a multi-function clip-on kWh product, delivering companies with the means of identifying potential cost reductions by showing exactly where their power is being used and therefore enabling cost effective measures to be put in place. The KLIK system is very fast and cost effective to install, all connections are plug-in. Pulse outputs and CT’s can be wired in low grade cable up to distances of 1km. Fitting is easy, supplies do not need to be isolated or cables disconnected and separate cubicles, panel cut outs and CT mounting kits are all unnecessary. Bobbin CT’s can even piggy back onto the 5A secondaries of existing CT’s or ammeter switch wiring. Energy profile detail can be collected by Building Management Systems (BMS), outstations or data loggers or any combination. KLIK22 meter pulses can be wired through buildings or transmitted across site by low power radio, across country by modem, or to a web site by GSM using additional equipment. KLIK V-Trac takes the concept of non-invasive installation one stage further. As well as using clip on CT’s, KLIK V-Trac only needs 1 phase voltage connection. It then creates the 3 phase voltage measurement vectors in a safe, quick and very convenient way.